The Natural Joint Mobility Lifestyle is not just a design of chair or seat it is a new attitude to the spine in which bending is considered good for the spine and there are only one or two cases where any care has to be taken. Equipment needed. It is essential to have one set of ‘bumps’ – nothing else. Let’s start with the activities that must be added to your lifestyle – first is sitting on the ground for at least half an hour each day with the back fully bent, relaxed, with the weight of the upper body taken largely on the abdomen. This is the best and most natural stretching exercise for the back and it is also a good stretching exercise for the muscles of the hip joint regardless of where the legs are – whether straight out (hamstrings), cross legged (adductors and gluteus minimus) or whatever- it is always a good stretch for some leg muscle. Note the DON’T "Never try to sit up straight when you are sitting on the ground – always slump"
Learn to squat with your heels on the ground as anyone in Africa or India can do for hours. Even a few minutes a day will provide very important stretching for various muscles in the pelvis, back, calves etc. We have been squatting for five million years and if we do not as a part of our lifestyle lots of muscles tighten up and cause problems. I have fairly recently come to the conclusion that, for the knees, sitting on one’s heels, as children do, is better for the knees than squatting. Most of us are so lacking in flexibility that squatting doesn’t achieve a full thigh against calf flexion. Sitting on one’s heels will! Even if it doesn’t initially. Squatting is still important, as I explain elsewhere, for anyone planning to get another human being through the gap between pubic symphysis and sacrum!! 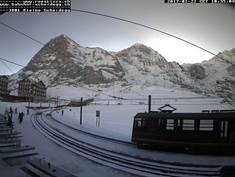 Wrong picture till I take one of “Sitting on Heels” Nice snow though! 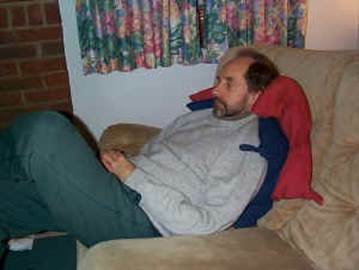 There is no need to take any particular care when sitting on a settee or easy chair watching television etc. Make sure you are sitting in a complete slouch. In this way, there is no tendency for the pelvis to roll backwards. It is balanced on the gluteal muscles and there is therefore no force at that critical joint between spine and pelvis. Note the DON’T "Never sit with direct support to the lumbar or lower thoracic spine (from the waist to the bottom of the shoulder blades)." It is far better not to sit up against the backrest, as you have always been told to, but to let the back bend evenly and naturally. Wherever you have to use a backrest and cannot sit in a complete slump, as for instance when driving a car, the backrest must have pelvic support either built in or by using the bumps. This is when you have to sit up, but cannot maintain the body shape with the muscles alone because of the position of the thigh and lower leg. Look at "Bumps" and "What is Pelvic Support?" to understand the distinction between this support and the conventional Lumbar Support. Note the detailed arguments in the "Evolution of Low Back Pain" showing that Pelvic Support and Lumbar Support are not similar, they are the exact opposite of one another in their effect on the joint between the spine and the pelvis. 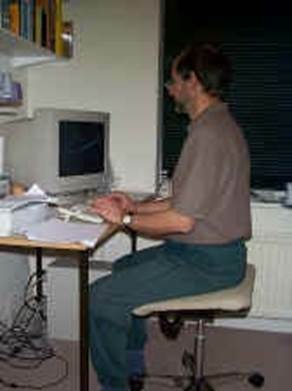 It is not absolutely essential to have a pelvic support seat for working at an office desk. It is perfectly possible to do without a back rest completely and to sit with the body in the same shape as standing. 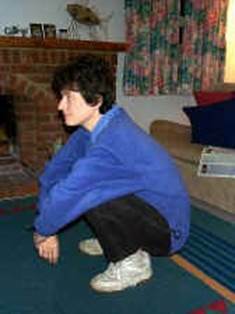 I refer to this as Alexander Sitting because this form of sitting is taught as part of the Alexander Technique. The body is effectively standing from the seat bones with the whole spine in the standing shape or flexed slightly- and of course able to move freely because there is no backrest. 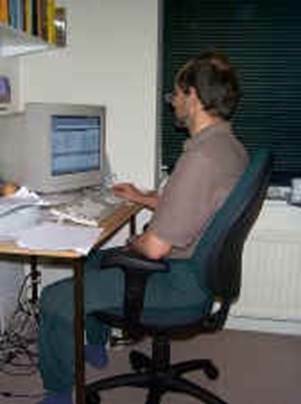 Note that adopting this sitting position is much easier if the thighs are angled down from the horizontal by 10° or so with a forward tilted seat and as the seat goes back beyond horizontal to backward tilting it becomes impossible to sit in this way. 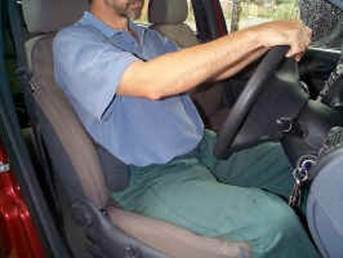 This is why the same advice cannot be applied to sitting in a car or to any situation where the knee is above the hip. That is of course not the only way to sit at an office desk, nor is it the way that most people choose to sit. Most people choose to sit fairly upright and use a backrest. In this case, it is essential that the backrest provides pelvic support and not lumbar support- for the reasons that also apply to all other back rests. There is really a complete spectrum of satisfactory desk working positions (see ‘Desk Seating Positions). 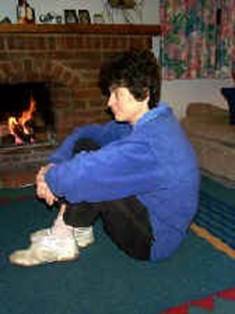 A Total Long-Term Solution is really as easy as that and gives us permission to do many of the things such as slumping on the ground and slouching on the settee which we have always done anyway. The only cases where real care is required are those cases where the mechanics of the sitting position are trying to bend the joint between the pelvis and the spine without bending the rest of the spine. If you keep to this sort of principle through life you will maintain flexibility, avoid excessive flexibility at the one point where you should not have it and probably dramatically reduce the probability of hernias, hip joint replacements, knee problems and a multitude of other problems caused by the unnatural way that our spines develop in our civilized lifestyle. Do not forget though that most of us are starting with a spine that has had a long time to develop wrongly and I cannot make any promises about how long it will take or how many problems you will encounter on the way!